Welcome to another roundup of news for the past few days, together with Laurel Brunner’s Verdigris Blogs from Friday of last week and the week before, and a new article in Online Features from Druckteam Berlin and Heidelberg. You’ll also find 18 new articles in our FESPA Newsroom, bringing to the total for FESPA Digital to 73, and for FESPA News to 11, following what turned out to be a fantastic event in Munich, and a reminder of how proper trade shows really should be after the rather uninspiring and sharp contrast of Ipex in London a couple of months ago. On the very first evening of FESPA, Durst certainly set the tone and the standard with a magnificent event for the international trade press at BMW Welt near Munich. EFI followed the next day with an excellent networking press lunch for which it is becoming renowned at major exhibitions, where such events provide invaluable time-out and are appreciated. A sincere thank you to both Durst and EFI.FESPA this year not only looked and felt like a real trade show should (and used to do), as it had all the right exhibitors, new innovations, lots of new kit, new software and materials or substrates, visitors in both quality and numbers, the right buzz, the essential vibe, the enthusiasm, the networking, the sales and quality leads, and to top all of that, the sun came out to provide glorious weather for the duration of the event.The only thing I didn’t enjoy was the tiresome trek on the U-Bahn to and from Messe Munich to the city, which like Munich’s airport, is an awful long way from the city centre. In fact, you can fly to Düsseldorf in the same time that it takes to get to the Hauptbahnhof on the train from either the Messe or the Airport, so next year’s event in Cologne (also Germany, which is a big plus-factor for those travelling from the rest of Europe and even further afield) should enable FESPA to again break this year’s all-time records, within an even more compact and visitor-friendly infrastructure from 18 – 22 May 2015, when the weather should also be ideal.Next stop, of course, is FESPA Africa 2014 at the Gallagher Convention and Exhibition Centre in Sandton, Johannesburg, from 2 – 4 July, incorporating both the Sign Africa and Visual Communications Africa events. As there aren’t that many news items for you to go through due to serious MacBook-related problems during my extended trip, I shall leave you to browse through them without prompts from me, apart from drawing attention to the new appointments announced on Wednesday from KBA, Kodak and EFI, and QuadTech’s new partnership with Muller Martini for its web presses. But there’s much more if you take your time when browsing through the headlines.including Screen’s appointment of Rotocon as Southern Africa reseller for the Truepress Jet digital label press. This follows Ipex Machinery’s appointment to handle both Screen wide-format and Screen high-speed digital inkjet web presses in the region. Kemtek retains Screen prepress and computer-to-plate. 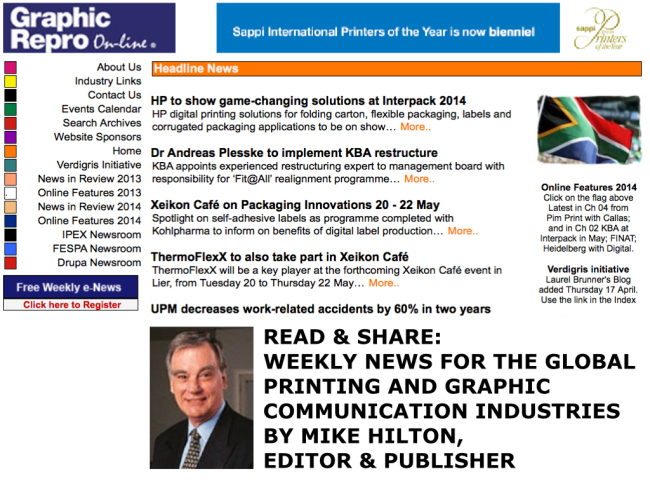 The tailender this week goes to HP on Friday, as it expands production inkjet possibilities with a new HP Priming Solution, and the HP T260 660mm-wide Mono Inkjet Web Press for book production; and in today’s headlines you will find a complete Muller Martini SigmaLine with HP T300 Web Press and inline Acoro A5 perfect binder: a world premiere in this form at Rodona in Pamplona, Spain for soft cover book production. Sun shines on world of wide-format at record-breaking FESPA Digital 2014 in Munich with 30% increase over Hamburg in 2011…EFI LED curing shows energy savings of 82 per cent! Nearly four months out from the event, taking place 21 – 23 August 2014, 30 per cent of exhibitors are international brands, up 10 per cent on last year..
Antalis South Africa, Dainippon Screen, Drupa 2016, EFI and EFI Vutek, Esko, Epson Europe BV, FESPA. Goss International Inc, Heidelberger Druckmaschinen AG, HP Graphic Solutions, Kodak, Koenig + Bauer AG, Kemtek Imaging Systems, Konica Minolta, Krause-Biagosch, Leonhard Kurz Stiftung, Manroland Web Systems GmbH, Muller Martini AG, POLAR-Mohr, QuadTech Inc, Quark Inc, Ricoh Europe, Sappi Limited, Sappi Printers of the Year, Print Process Champions Group, Thunderbolt Solutions, and UPM-Kymmene.